Problems, recurrent and new, hindering the enforcement of rights continue to obscure the horizon for mark owners operating in or wishing to enter the Chinese market. However, positive developments are brightening the landscape and should also be acknowledged. Canada is a G8 country with a distinctive trademark system and a competitive market for legal services. Throw in a long, heavily populated border with the United States and you have a jurisdiction that few rights owners can afford to ignore. A marketing background and a new focus on the company’s master brand mean that Nortel’s head of trademarks, Alex Brkich, is able to run a tight ship that does not stint on the quality of service it provides. It’s a story that involves royal dynasties, new world settlers, the collapse of Eastern European communism and a place that some say doesn’t exist. 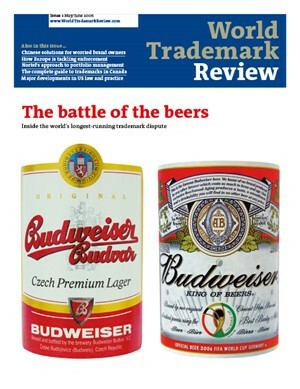 But at its heart, the interminable dispute between brewers Anheuser-Busch and Budejovicky Budvar over the name Budweiser is all about trademarks. On the basis that trademark filings indicate – to some extent – how much trademark work firms handle, we take a look at the top 20 Canadian filers of trademark applications and at their trademark practices. Trademarks in Canada are administered by the Trademarks Branch of the Canadian Intellectual Property Office. Current challenges include dealing with delays in the opposition procedure and assessing the potential benefits of signing up to several major international trademark agreements. Much is being made of the implementation in the European Union of the IP Enforcement Directive. But what will the directive change in practice? Each industry has its specific trademark challenges – for fast-moving consumer goods it is dealing with copycats. Monitoring new legislation and dealing with competing retailers are two key aspects of the in-house counsel’s role in meeting this challenge. The view onlineFalse WHOIS information – is enough being done? Accurate WHOIS information is crucial for mark owners to identify online infringers. However, around 5% of domain names issued in the United States are registered using “patently false” contact information, making it difficult or impossible to contact the sites’ owners. Trademarks are not static so it is important that companies review their portfolios on a regular basis. Too often though, this does not happen. Thus, it is imperative that a company’s trademark assets are reviewed regularly. Trademark owners, governments and law enforcement agencies all claim to want to eradicate IP crime. The problem is they find it difficult to work together to achieve their aims. It has been a busy period for US trademark owners. In this roundtable discussion, four US practitioners talk through some of the major issues to have emerged over the last few years.